If I am modelling sentence construction or the semicolon, drawing a map illustrating colonialism in Africa, or scribing arrows outlining connections between ideas, I want to be able to do it quickly: as quick as I think; as quick as I talk. I want to be able to teach with my whole body, use gesture, employ pause to illustrate nuance, become as one with the board; become, in those rare moments of flow, both dancer and dance. Now the board dictates that, rather than pirouette, twist and enthuse, I click a frigid button. This picture is a shot from a wonderful film by Samira Makhmalbaf which won Grand Prix du Jury at the Cannes Film Festival 2000. 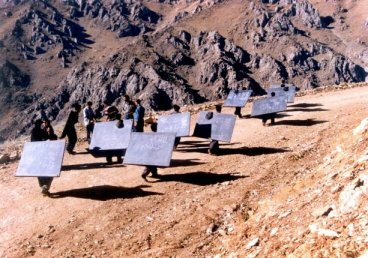 The film is a tale of a band of teachers, who, with blackboards on their backs, wander in search of students from village to village in remote mountains of Iranian Kurdistan. See a larger picture; you may notice that the blackboard of the leftmost teacher is covered with mathematical or physical formulae. It is relatively easy to explain why a projector-only lecturing is unsuitable for mathematics. A mathematics teacher is not just conveying information, he or she teaches to think mathematically, and teaches by example, in real time. It is crucially important to be in full control of timing and tempo of the narrative. If a lecture involves calculations (and they are inevitable in most mathematical disciplines), it is crucially important to let students feel the subtle play of rhythms, emphasize switches and branch points in the procedure, highlight recursion and reduction to simpler cases. and the list of examples can be easily expanded. the internal mental image of the concept of “convergence” is the shared component of the meaning of the spoken phrase which describes convergence, and a semi-conscious or unconscious gesture which accompanies the phrase. At a first glance, the idea appears to be far-fetched, until one checks the list of experimental evidence showing intimate relation of speech and gesture. I quote Nunez’s paper, where the list is supported by detailed bibliographic references. Speech accompanying gesture is universal. This phenomenon is manifested in all cultures around the world. Gestures as less monitored than speech, and they are, to a great extent, unconscious. Speakers are often unaware that they are gesturing at all. Gestures show an astonishing synchronicity with speech. They are manifested in a millisecond-precise synchronicity, in patterns which are specific to a given language. Gestures can be produced without presence of interlocutors. Studies of people gesturing while talking on the telephone, or in monologues, and studies of conversations among congenitally blind subjects have shown that there is no need of visible interlocutors for people to gesture. Hand signs are affected by the same neurological damage as speech. Gesture and speech develop closely linked. Studies in language acquisition and and child development show that speech and gesture develop in parallel. Gesture provides complimentary content to speech content. Studies show that speakers synthesize and subsequently cannot distinguish information taken from the two channels. Gestures are co-produced with abstract metaphorical thinking. Linguistic metaphorical mappings are paralleled systematically in gesture. We can now return to our blackboards. Well, psychophysiology of gesture explains why, in teaching mathematics, a blackboard is better than a Powerpoint presentation, but why are blackboards preferable to whiteboards? The following observation belongs to Israel Gelfand. Using chalk on a blackboard, we write by moving the entire arm. With felt markers on a whiteboard, we use smaller scale movements of fingers and the wrist. At a purely instinctive, physiological level, people tend to hold breath when they do small movements with their fingers. On the contrary, wider movements of arms fit naturally in the cycle of breathing and speaking. In mathematics teaching, we have to write on the blackboard and speak more or less simultaneously (although I take care to never speak “to the blackboard” and turn to face the audience every time I utter a word – but I do keep chalk pressed against the board, thus ensuring that I continue writing exactly from the spot where I stopped). In a lecture, the lecturer has to speak clearly, loudly and project his/her voice onto the audience, filling the whole room with the sound. Ever tried to do that while writing with a thin felt pen on a transparent roll of film (yet another horrible contraption found in many lecture rooms)? For the first installment, I said enough in defence of blackboards — but I invite comments from my colleagues, I would really like to enmasse our collective wisdom on the subject. Mathematics teaching is not a science. It is an art. Moreover, it is a performance art, like drama or ballet, and should be treated as such. Unsurprisingly, ballet dancers are very fussy about the state of the stage floor: they need a surface with just right level of friction, support and spring. Normally, we are very fussy about the quality of the blackboard surface -I can tell a lot on that subject. Unfortunately, we are reduced to fighting for continuing existence of our old blackboards; we do not even dare to raise the issue of their quality. Ddisclaimer: my posts do not necessarily constitute or represent the views of my University. Most video abstracts are taken in front of a blackboard, while these professional mathematicians try to motivate their colleagues to read their paper. This is in fact a teaching situation. A wonderful post, Alexandre! I have many comments. For now, let me just add that there are many disciplines where some crucial knowledge is communicated to new learners ONLY in the physical demonstration by a lecturer of some argument. Perhaps this is because it it not possible to communicate the knowledge in any other manner. In Economic game theory, for example, it is very hard to find an adequate written treatment of extensive form representations of games (ie, games as tree diagrams), because economists, to a person it seems, acquire their understanding of the semantics of these diagrams from one another in personal, face-to-face, contact, and nobody has bothered (or is able) to write this knowledge up in a textbook. The situation is similar with the use of so-called comparative statics in Economic Theory – the use of graphs in the XY-plane to compare one state of a complex adaptive system with another, later state or states. I don’t know of any adequate written treatment of this type of reasoning which could explain to a complete novice what is going on, without someone who is already knowledgeable drawing the diagrams in real-time in front of the beginner. The same is true, I suspect, with commutative diagrams in category theory. Is there, anywhere, an adequate written explanation of the reasoning involved in chasing arrows around a commutative diagram which would explain the reasoning without having to resort to a person-to-person real-time drawing? * Powerpoint/pdf is certainly a problematic medium for general maths teaching. * There is a bit of a mystique attached to blackboards – there’s an appeal to the lecturer in making a big deal of the performance aspect – I’m very suspicious of comparisons with ballet dancing or piano concerts. Sometimes I wonder if *some* of the proponents of this are the same people who cover blackboards very energetically in loads of disorganised stuff and thereby give the most awful lectures. Certainly I have been harangued on this by people whose seminars I would leave the country to avoid attending. * It is all very well to dwell on the virtues of a successful blackboard (or other) lecture, but one has also the reality very often of a large proportion of the audience copying down stuff passively without much understanding. One point about some other modes of communication is that the availablity of the presentation afterwards makes it clear that the medieval scribe aspect of traditional lecture attendance is not the main point. * This year, instead of blackboards (my preferred medium – it certainly is more fun for the lecturer), I am lecturing on A4 sheets under a document cam. Maths is still being done “live” and one naturally faces the audience. The students seem to prefer this to a blackboard. This blog entry has caused me to think a bit about the extent to which this mode of presentation is less dynamic. * The blackboard is rather dangerous in some ways: it is so tempting to write and write and write – to imagine that once it is written on the blackboard it is almost learnt. I increasingly feel I want to do less Maths myself in a lecture and have the students do/interact more. * The transience of a blackboard presentation is appealing in the same way that a stage play is. On the other hand, there are many forces now in HE such as the need for notes for dyslexic and similar students, the likely growth of distance learning, etc, that I can’t really see the blackboard as the future- we will need things more suitable for the digital age.